Overview - Critics everywhere have hailed "Infernal Affairs" for its gritty action and international superstars. Chan Wing Yan (Tony Leung, "Hero") is a hard-nosed veteran cop sent undercover to infiltrate the notorious Triad crime ring. An expert at bringing down violent syndicates, Chan thinks it's going to be a routine mission. What he's not prepared for is the discovery that the Triad's boss (Eric Tsang, "The Accidental Spy") has planted a mole (Andy Lau) "The Legend Of Drunken Master" in the police department... and now Chan is being hunted down. In this battle of wills, only one cop can win. While I was aware that Martin Scorsese's 'The Departed' was a remake of a Chinese film, for some reason I always assumed that it was merely a very loose adaptation, taking the basic gist of a previous plot to end up with something completely different and unique. It's with that preconceived notion that I went into watching 'Infernal Affairs,' the Hong King crime drama that inspired Scorsese and screenwriter William Monahan's Academy Award winning version. After watching the film, that previous notion has been shattered. A tense, twisting examination of the fine line between good and evil, 'Infernal Affairs' presents a remarkably similar experience to 'The Departed,' providing all the meaty groundwork for the latter's slightly superior success, while still proving to be a very solid film in its own right. Those that have seen Scorsese's effort will be right at home with the plot. A tale of two moles, the story follows an undercover cop, Chen Wing Yang (Tony Leung), as he infiltrates a crime organization, and a criminal, Lau Kin Ming (Andy Lau), as he poses as a police officer. As both informants attempt to carry out their clandestine tasks, they begin to cancel each other out, and soon their police and criminal superiors become aware that there are spies among them. Tension rises as both groups seek to smoke out the traitors in hiding, leading to numerous twists and turns that culminate in a suspenseful and exciting finale. All of the major beats from 'The Departed' originate here, including some of its most iconic sequences. The opening montage, the movie theater chase, the typo on the envelope, the silent phone call, the rooftop "mishap," and even the infamous climax in the elevator are all covered to some degree. As someone who saw the American adaptation first, these plot points couldn’t help but lose some luster, but to the original filmmakers' credit, the strength of the script and performances still shine through, even when I knew what was coming. The character work is also strong, and the movie's rumination on humanity's dueling morality is powerful, enhancing the action and suspense with deep thematic material. As I've probably made clear by now, it's really hard to discuss or critique 'Infernal Affairs' without drawing comparisons to Monahan and Scorsese's retelling of the story. While it's rare for remakes to actually surpass their source material, in this case, I do think 'The Departed' is the superior film, and indeed it makes some of the shortcomings here more apparent. The setup involving each informant's infiltration into their respective organizations is glossed over too quickly and while character development is strong, many of the supporting roles lack personality and depth. In many ways, Monahan took the original script and simply refined and elaborated upon it, expanding the running time to flesh out concepts and characters, evolving the source material to the next level. One of the most significant differences between the two films involves the love interests. Here, each mole is given their own separate romantic partner and with all the twisting suspense and action, both romances get slightly lost in the shuffle and come across as undercooked. The climax itself also feels a little rushed with some important transitional information abruptly presented as text on-screen. The definitive, violent justice that occurs at the very end of 'The Departed' is nowhere to be found, and the filmmakers instead present a more philosophical type of retribution. While less satisfying, the more internal conclusion is still very powerful in its own right. 'Infernal Affairs' is a thrilling crime drama that deals with the lesser demons and better angels of the human heart. While the American remake actually improves upon many of its aspects, the story, direction, and performances are still very strong, and most of the celebrated moments from that Oscar winning effort all originated here. In many ways, both films present a rather fascinating example of the adaptation process, providing a unique illustration of the significant effects that tiny alterations and large expansions can both have. Though many will likely want to check the film out solely to draw comparisons to its DiCaprio/Damon starring cousin, general fans of suspenseful, gritty action should find a lot to like regardless of its Hollywood connection. 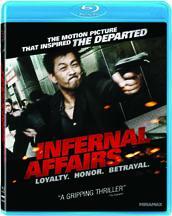 Lionsgate brings 'Infernal Affairs' to Blu-ray on a BD-25 disc housed in a standard case. After some skippable trailers, the disc transitions to a standard menu. The packaging indicates that the release is region A compatible. The movie is provided with a 1080p/AVC MPEG-4 transfer in the 2.35:1 aspect ratio. Though Christopher Doyle's photography has many strengths, there are some inherent stylistic and technical issues that hold back the presentation. The print is in pretty good shape with some minor specks here and there. A light to moderate layer of grain is visible throughout, bolstering the film's gritty subject matter. The image has a very sharp quality but true fine detail isn't as strong as one might expect. Unfortunately, one of the main drawbacks to the transfer is some occasionally troublesome edge enhancement that presents noticeable halos around characters and objects, giving the picture a harsh, electronic look. Colors are intentionally muted, with Doyle presenting an almost monochromatic image bathed in a cool, subdued palette. While this works well with the tone of the content, it doesn’t make for a very interesting image and leads to a slightly flat picture that lacks pop. Contrast is high, with some shots looking a bit overexposed (again, this seems to be intentional) and black levels are fairly consistent and deep. There is a lot to admire about the video here, but some noticeable edge enhancement can be a real eyesore and the film's intentional, stylized look doesn't exactly impress to begin with. While the transfer gets the job done just fine, the movie won't be wowing audiences with its video presentation. The audio is presented with a Cantonese DTS-HD Master Audio 5.1 mix and an English DTS-HD Master Audio 5.1 dub with optional English, English SDH, and Spanish subtitles. With an exciting score and some exhilarating but sporadic action scenes, this is a very solid and occasionally thumping track. Dialogue is nice and crisp with no hissing or pops. Directionality across the entire soundscape is strong, with the film's rousing score dispersed nicely throughout the front and rear speakers, adding some booming atmosphere to the visuals. Surrounds also come alive during the major action set pieces, filling the room with whizzing bullets and squealing tires. Dynamics are strong, maintaining fidelity throughout a wide gamut of frequencies without distortion, and bass has some welcomed punch in the music and action. The film can actually be surprisingly quiet at times, and thankfully balance between all of the audio elements is handled well, placing appropriate emphasis on loud and soft effects. 'Infernal Affairs' sounds good but not quite fantastic. The mix adds some welcomed immersion when it needs to and does a great job of spreading out the score and music cues for a sometimes enveloping experience. Lionsgate has included a slim but decent collection of supplements, including some featurettes and an alternate ending. All of the extras are presented in standard definition with Cantonese Dolby Digital 2.0 sound and optional English subtitles. The Making of Infernal Affairs (SD, 15 min) - This is a standard promotional piece with some behind-the-scenes footage along with cast and crew interviews. The participants focus on examining the characters, plot, and themes, with an emphasis on the film's rumination on good and evil. There are some decent insights into the story, but for the most part, this is a pretty uneventful featurette. Confidential Files: A Behind-the-Scenes Look at Infernal Affairs (SD, 6 min) - This is a brief run of mostly raw behind-the-scenes footage taken during the shoot. Though short, it is interesting to see how some of the scenes were shot and a few of the interactions on-set are rather amusing. Alternate Ending (SD, 3 min) - An alternate ending is presented here that features a different outcome for Andy Lau's character when he exits the elevator. Rushed and clumsy, this ending was wisely excised for the more refined conclusion used in the film. International Trailer (SD, 2 min) - The film's international trailer is included with no subtitle options. Original Chinese Trailer (SD, 2 min) - The film's original Chinese trailer is included with no subtitle options. Trailers (HD) - Several trailers for other Lionsgate releases are included. Though it's most famous for being the inspiration for 'The Departed,' 'Infernal Affairs' is a great film in its own right. With its exciting plot and insightful themes, the filmmakers present a crime drama that is full of suspense and depth. The video transfer suffers from some notifiable edge enhancement but still looks solid, and the audio brings some welcomed excitement during the film's action scenes. Supplements are a little sparse but worthwhile. Though not a particularly great disc, this release is recommended and big fans of Scorsese's celebrated adaptation should definitely check this out.